Before I worked in digital signage, I was running video boards for professional sports. As a sports fan, I often would escape the control room and head down to the seats to take in the game. I didn’t care what game it was or what the score was, I just loved sitting with a crowd in a live sporting event. I like watching people. The more I watched people, the more I studied them. I observed how they reacted when the video board was trying to command their attention. And I realized that the single most important reason I was doing any of this was sitting right next to me gobbling down cold hot dogs and drinking warm beer. Not the product or the content or the service or the technology. None of that is important if you don’t focus on the user. It’s about the person who comes up to the screen and wants to engage. It’s about knowing how that person enjoys using touch screens, what kind of education she has, and her level of patience before she walks away. It’s about knowing that the user must be rewarded for his time with you. This isn’t a call to action, this is a two-way relationship. He has made the effort to get to know you. What will you do for him? Technology, for all its wonder, has given us license to replace human interaction with keyboards, mobile phones and video walls. But the farther we go using technology to create an experience, the closer we must get to the humanity of engagement. We must begin with people. I’m in the “content is king” camp. Many of my colleagues live in other camps, and skirmishes often break out across social networking platforms. But the one thing that no one can argue is why we do this. I’m writing about it now because I believe this has been lost in the transition to bright, shiny high-definition screens. Today, touch screen interactivity is more interesting than the person who is using it. Over the past several months, we have seen a slew of videos on the Internet showing some pretty amazing things, such as 3-D mapping on the side of giant buildings and multiple HDTVs in an interactive street-side wall. The one thing we have not seen is the impact. The videos show the interactive screens and people touching them. This is awareness, not an impression. What we need to understand is how this affects people—how this engagement becomes a priority in the user’s mind so that action is taken. We need to understand these people. With these types of very public interactive and visual experiences, trying to identify a demographic is futile. Your audience demographic went from 18- to 34-year-old males to everyone between 5 to 95 years old. And in most verticals, demographic segmentation has eroded. Even though a venue might have a primary audience target, there’s a very good chance that the target has a spouse, child, parent or friend. Are they in the demographic target, too? At the end of the day, there is one question on the mind of the marketer who spent all that money to put this visual eye-candy in front of everyone: What is my ROI? The culture of screens everywhere is pushing the metrics into reality; the numbers will stabilize and be the standard for a long time. Until then, the question remains, and it keeps a lot of financial people awake at night. Is this experience worthwhile? Will I get out of this what I put into it? While the traditional methods of communication—newspapers, TV and even Internet, to a degree—continue to wane, they are still safe bets because they are surrounded by years of measurement. Until digital signage, in all its forms, meets this standard, it will be a crap shoot. While the numbers are a bit foggy, there are a few things you can do to ensure that the experience is appealing to the people. There are plenty of outstanding companies that provide measurement services and will gladly hand you a stack of research. But, research firms can only measure what you give them. Garbage in equals garbage out. The best way to really understand whether a concept will work is to go and see it as the customer does. Don’t go with your colleagues, co-workers or boss. Go by yourself. Better yet, go with people who have no interest in your project, such as your children or a friend. Gauge how they react and how you react to their reaction. Be the audience you’re trying to impress. When I worked at Best Buy, I drove the initiative to display closed captioning on our closed-circuit home theater program. The audience (and corporate) response was phenomenal. While consulting a company several months back about a portrait screen they wanted to put in a lobby, I asked if they thought about compliance with the Americans with Disabilities Act. They had not. They went back and moved the buttons from the top of the screen to the bottom of the screen. Again, the response was outstanding. Keep in mind: You may have a perfect audience, but every single person in that audience is different. A few simple techniques can overcome myriad physical and mental variables. Speaking from experience, it’s the little things that mean a lot. Make sure your experience works for everyone. While I worked in baseball, it was crucial we spend every inning break pushing content out to the video boards. These breaks were the optimal time to get the audience’s attention and sell them stuff. When you develop your experience, there will be no shortage of research, planning, meetings and consulting. Everyone will have an opinion about what you should do. Don’t get caught up in it. All of this information is fundamental. But to truly know what works, you have to break the rules. You have to try things that might not work. You have to push the edges of what might be acceptable. Why? 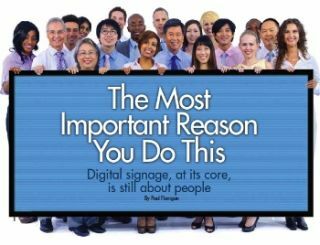 Because digital signage is radically different from every other kind of messaging you build into your venue. It can be amazing, interactive and compelling. You won’t know until you try. This is not permission to insult your viewers or your advertisers. On the contrary, this is the way you learn about what works and what doesn’t. This is what separates you from your competitors. This is what will make your network, and you, unique and spectacular. Break the rules. You’ll be amazed at how many you’ll rewrite. You want to connect with people. You want to develop a relationship with them. Technology may replace humans in some form, but they will never replace humanity, that almost metaphysical experience of interacting with another human. Because of this, technology can be a terrific complement to the entire experience. And the more you know about people, the more engaging your technology will be.